November 13th, 2016 – Florida, Alabama, Mississippi, Louisiana, Texas – Pushing west, sights set on canyons, arches and other rocky landmarks. Nights at truck stops and rest areas. A little detour through a town where my family lived before I was born, a short stop at Stennis Space Center, over the Atchafalaya Basin Bridge and into Texas. It isn’t hard to rise early when you are parked in a truck stop. In fact unless you are pretty tired or just not affected by the noise of constant activity sleeping here might not be easy. But I’m pretty good with noise when sleeping and I was pretty tired after a long day of activity. Nevertheless, I was up, through the narrow bit of Alabama and at the Mississippi welcome center by about the time they opened. 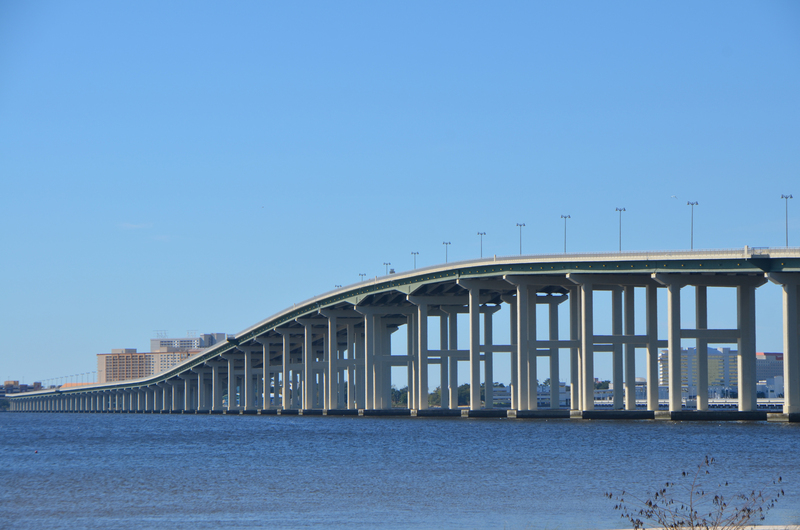 I inquired about the town of Biloxi and how to add it to my route. My father was stationed there a couple of years before I was born and I figured I should at least drive through since I was here. They showed me that it wasn’t far off the main route, and as a bonus it would be somewhat scenic. 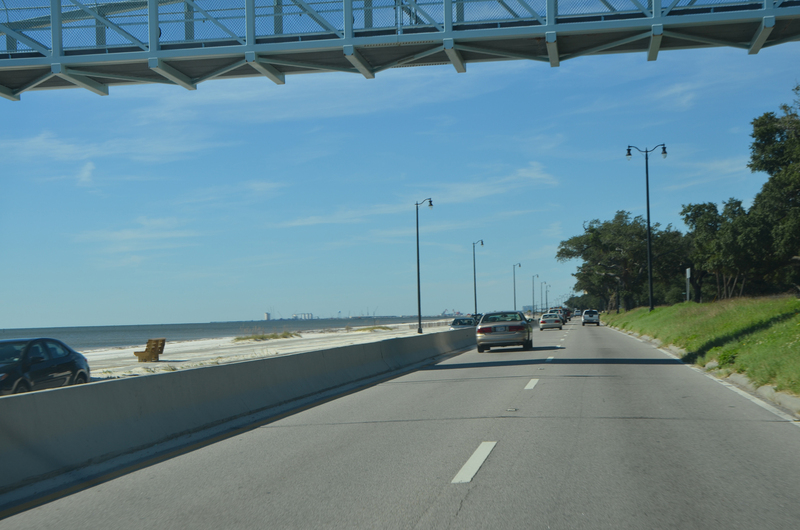 I cut down from I-10 near Ocean Springs, and onto US-90 right before the Biloxi Bay Bridge. 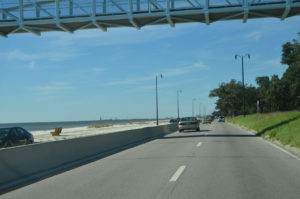 As I passed through Biloxi it was a bright sunny morning, and not too hot. The road is mostly a divided boulevard and follows the shore. There is mostly beach on the left, with a few exceptions where businesses were built up on piers or the road strayed just a bit further from the water. On the right are houses and businesses with some breaks. As I was poking along I gave Ma a call and we chatted a little about what she remembered of those days. Next I called each of my sisters, not that they would remember much when they were so little, but for the novelty of it. It was a nice way to slow down a bit while still making progress west. 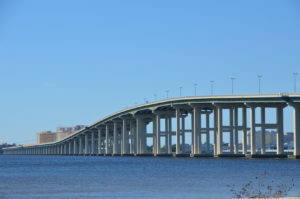 The beach drive ends at the west with the US-90 bridge over Bay St. Louis, and then heads overland to join up with I-10 again. Right at that intersection is the Infinity Science Center which doubles as the Stennis Visitor’s Center. More about that in a previous post. I mostly skipped over the culture and such of New Orleans on this trip. I have been here before a couple of times and between the trailer and the cooling weather I wanted to keep moving. I did get off the freeway for a bit and drive through some of the downtown area, but then back on I-10 through Baton Rouge and over the Mississippi. It seems to me that part of this route had to do with avoiding a tunnel that had restrictions on propane cylinders, but details escape me now. 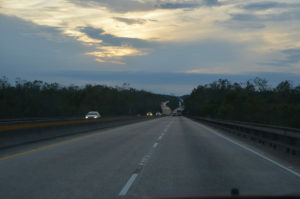 Now west of the Mississippi, soon the road becomes the Atchafalaya Basin Bridge. 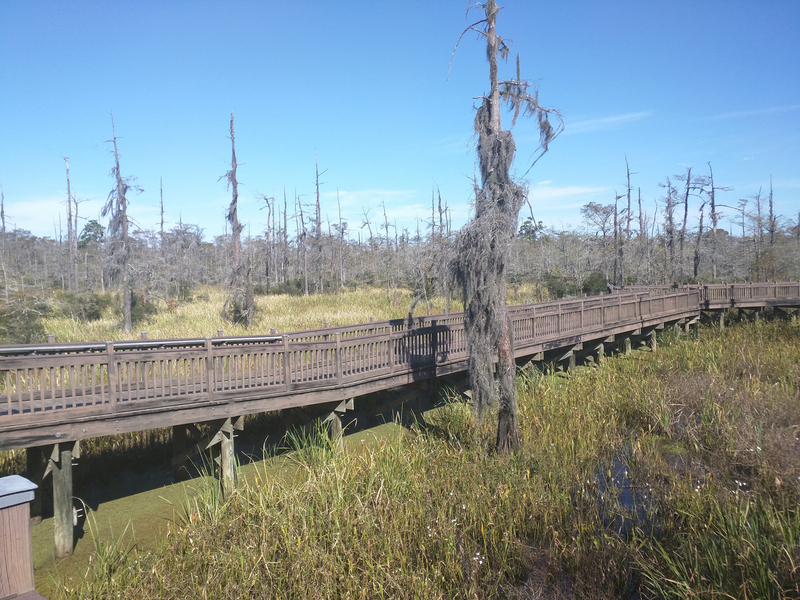 A pair of parallel bridges 18 miles long they pass over one of the largest wetlands in the nation. At mile 121 there is a welcome center and arriving a bit late I ended up parking here for the night. Alas, I was also away early enough that I didn’t get opportunity to go inside, but I did wander a few miles along a gravel road to see a bit of the swamp. Honestly it was a lot easier to see the area from the bridge than down close, so away I went. Just over the border into Texas is a Travel Information Center with a very nice raised walkway out over a swamp similar to those I had been driving above. While there was a bit of freeway noise, it was muted and the quiet air was pleasant and fresh. This is apparently a fairly new facility opened in 2012. 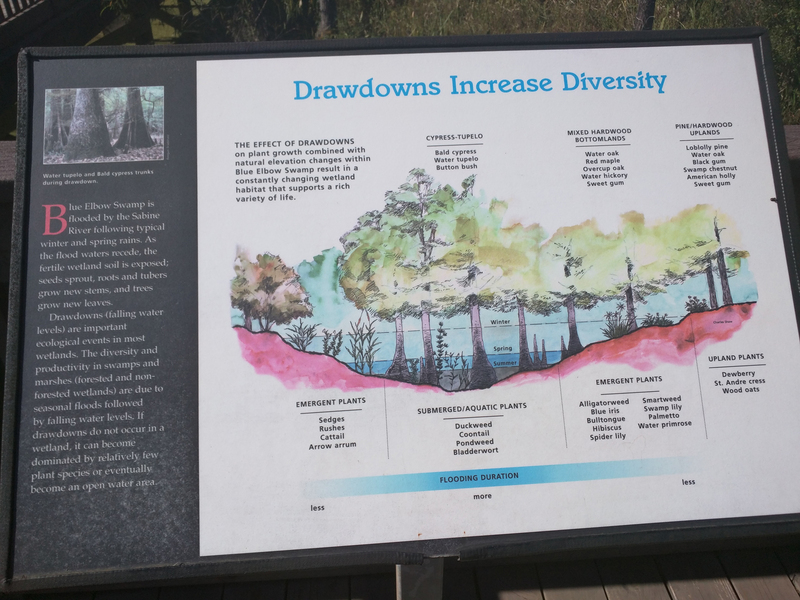 Atchafalaya – as big as this is, I’m amazed I hadn’t heard of it before. A view from one of the few rises in the Atchafalaya Basin Bridge. Two bridges really, 18 miles long. Looking out the passenger window at the swamps below. Texas Travel Center nature walk. Just outside the visitor center the walk starts with a larger open deck. and a cast of this Alligator Snapping Turtle. Something for the kids to snuggle up to. Short walk was just enough to stretch the legs but not challenge the stamina.